Tarcoles, Garabito – Welcome to Casa Majestic, a beautiful five bedroom home located in the hills above the beaches near Punta Leona and Playa Agujas in Central Pacific Costa Rica. This property is in immaculate condition situated strategically on a large parcel of 10,275 square meters (2.53 acres) in a gated community, with easy and scenic paved access all the way from the Coastal Highway to the entrance of the home. This is an ideal property if you are seeking a beach location, yet with elevation and views, a quiet Shangri La of tropical scenery, the ever changing Pacific ocean. Scarlet Macaws, green parrots, toucans, white face Capuchin monkeys are regulars in the area. Access to area beaches and Coastal highway is just a few easy minutes away. This location is only 15 minutes from the beach city of Jaco, five minutes to Carara national park and Punta Leona white sand beaches, as well as one hour to the capital city of San Jose, access to property is via excellent paved roads all the way to your driveway! Please call or write for more information or schedule in advance a viewing of incredible property. Esterillos Este, Esterillos – Announcing a price drop on CASA MACAW, Country Home, 1 mile to the beach!, a 2,300 sq. ft., 3 bath, 4 bdrm single story. Now $269,000. MOTIVATED! • 2,300 sq. ft., 3 bath, 4 bdrm single story – $269,000. MOTIVATED! Esterillos Este, Esterillos – Welcome to Casa Macaw, an exclusive new listing from Jaco Area Properties! 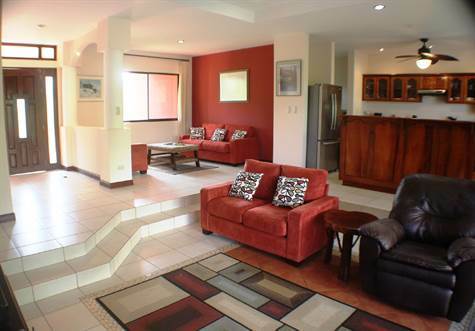 This single family home, on a spacious 1500 square meter lot (16,000 sq ft), is located in the beautiful Playa Esterillos area of Costa Rica, conveniently located just 20 minutes south of the beach city of Playa Jaco. And approximately one mile to the beautiful pristine beaches at Esterillos Este and Playa Bejuco. This area of high- end single family homes is located around a small lake and is accessed by a paved road a short distance from the Costanera (Pacific Coast Highway). The home was built to luxury specifications with all steel reinforced concrete block, Spanish tile roof, quality finishes, including granite counter tops, large ceramic tiles, and stainless steel appliances. Home is only 4 years old (built in 2012) and is in excellent condition. Although the home has never been put on the rental market by the current North American owners, the rental income potential is excellent (if desired). There is a property manager available in the immediate area and a low HOA fee of $150 a month covers security and gardening. THIS FEE IS OPTIONAL, but a great option for part time owners. There is also a beach club at the beachfront location in Esterillos Este. Open floor plan accents plenty of large screened windows and sliding glass doors, exploiting the wealth of natural lighting (sunshine) and flora and fauna in this area. There are almond trees in the backyard where scarlet macaws roost, as well as Mango trees and a large lawn area. Home is private, secure and picturesque. The home itself features a master and two guest bedrooms, and a smaller bedroom/den/office. The master bedroom is extra large with sitting area as well as en suite bathroom with Jacuzzi tub, twin sinks and walk in closet. There are ceilings fans and recessed lighting throughout, a sunken TV/Den area, as well as sunken dining area, adding to the sense of separation and purpose throughout. The large kitchen with granite countertops, stainless steel appliances, and breakfast bar is complimented by beautiful custom built cabinetry of local tropical hard wood. The beach club is open to all residents of this neighborhood and is located beachfront at Playa Esterillos. There is a large pool at the beach club as well as restaurant, bar, restrooms, showers etc. Please call or write me today for more information on this property. I also have a video of the area, I can send you the link. Esterillos Este, Esterillos – Announcing a price drop on CASA MACAW, Country Home, 1 mile to the beach!, a 2,300 sq. ft. single story. Now $269,000. MOTIVATED! Playa Hermosa, Garabito – This estate is located in Playa Hermosa, just south of Jaco Beach, high in the foothills of the Playa Hermosa range.This is a Seller who is extremely motivated due to very serious health situation, hence the excellent price on this property. This property is for a specific type of buyer who is not afraid of dirt roads, country living, and a somewhat remote location. 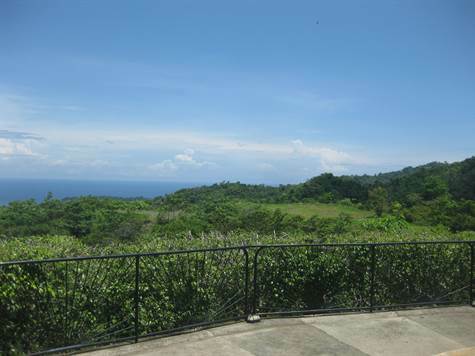 This property is approximately 20 minutes (drive time) up into the breathtaking mountain areas above Playa Hermosa. The views and wildlife are world class with never ending views of virgin jungle canopy, several miles of coastline, twinkling lights, sunsets, rain showers, birds flying the air currents BELOW your view point, etc etc. This is an amazing property for the specific type of owner that wants seclusion, natural beauty, total peace and quiet. This property is fully functional and is being sold fully equipped with everything ready to go for new owners. This is one of the few properties that given it’s wide open feel, could easily be converted to a Bed and Breakfast, or small specialty hotel or retreat. Property sits on a huge lot of 6508 meters and can be expanded. Property is in excellent shape and there is a full time caretaker if needed. Please call or write today to discuss this property more in detail to see if this is the right property for you. Playa Bejuco, Puntarenas – Announcing a price drop on CASA FELICIDAD, w. Pool, Beautiful Home, Walk To Beach, a 1,500 sq. ft., 4 bath, 3 bdrm single story. Now $289,000. Exclusive Listing! • 1,500 sq. ft., 4 bath, 3 bdrm single story – $289,000. Exclusive Listing! Playa Bejuco, Puntarenas – Welome to Casa Felicidad, Playa Bejuco, Central Pacific, Costa Rica! This fully furnished, 3 bedroom/3 bath beach home with private pool, is located in a gated community and just 200 meters to the lovely beach of Playa Bejuco. This property is situated on a lovely, manicured, 500 square meter lot (5000 square feet) and has all the desired upgrades for beach living. You’ll love the private pool and fantastic”Jungle Backyard” with spacious patio areas, outdoor BBQ/Kitchen area, and storage bodega with second floor sundeck, outdoor bathroom and shower, as well as “Palapa Roof” hammock area. The interior of this beach house features a large “open” floor-plan, with living room, dining and kitchen area, as well as 3 beautiful bedrooms with en suite bathrooms (your guests will love you!). 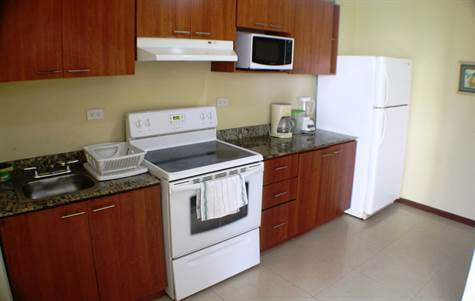 There is a fully equipped garage (electric) and large storage bodega and all tools, equipment, beach gear is included! Current North American owners have taken meticulous care of this home and it shows. There are brand new appliances (Frigidaire), flat screens (46” Samsung), and custom built furniture by local artisans specializing in Costa Rica hardwoods. There are new leather couches and ceiling fans. There is a completely new USA/CANADA GRADE electrical system throughout the home, with new lighting, surge protectors and energy efficient AC units. New screens on all doors and windows, the home was recently painted, new window dressings, the list goes on. This home looks BRAND NEW and this kind of “Pride of Ownership” makes for a home that holds its value and is a pleasure to experience. Clean, manicured, flora and fauna, 2 huge swimming pools, solvent HOA, tennis court, new grocery store and shopping center in the area. 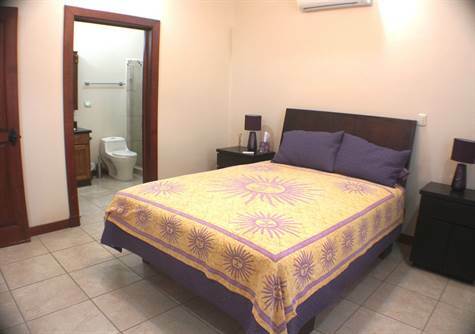 Only 2 hour drive to San Jose (capital of CR) and international airport, only a 20 minute drive to the beach city of Jaco, and only 30 minute drive to Manuel Antonio National Park (world famous CR destination). This area is gorgeous! Please call for more information (I’ve got it all) on this property and this area. This is an exclusive listing (co-brokers welcome) and viewings can be set up with 24 hours advance notice.